Supports your claims and helps readers understand your viewpoints. Shows readers how you arrived at your positions on issues. Gives credit to the authors whose works you use. Helps your readers find other works on the same topic. 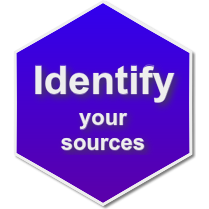 Allows your readers to check your sources if they have any questions. Gives you the opportunity to show off your research abilities! 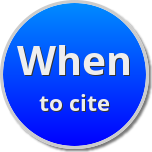 This guide is designed to help you understand and use the major citation style guides. Click on the tabs above or the links below to navigate this site. You might also be interested in Purdue University's Online Writing Lab (Owl), and Capital Community College's Guide to Grammar and Writing. Sometimes a citation is necessary, and sometimes it isn't. You don't have to type your citations out by hand! 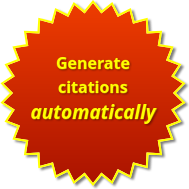 Here's how to generate citations automatically. What type of source did you find? Use this guide to identify it.